AMD business. HP asks for about 750 Euros (~$1030) for their ProBook 655 business notebook. For that price, the buyer gets an office device with an AMD APU, a matte display and a quick hard drive. Additionally, the computer is pre-equipped for the installation of an LTE modem and offers easy access to its inner workings for maintenance. But does the notebook do well in practice? Read our review to find out. 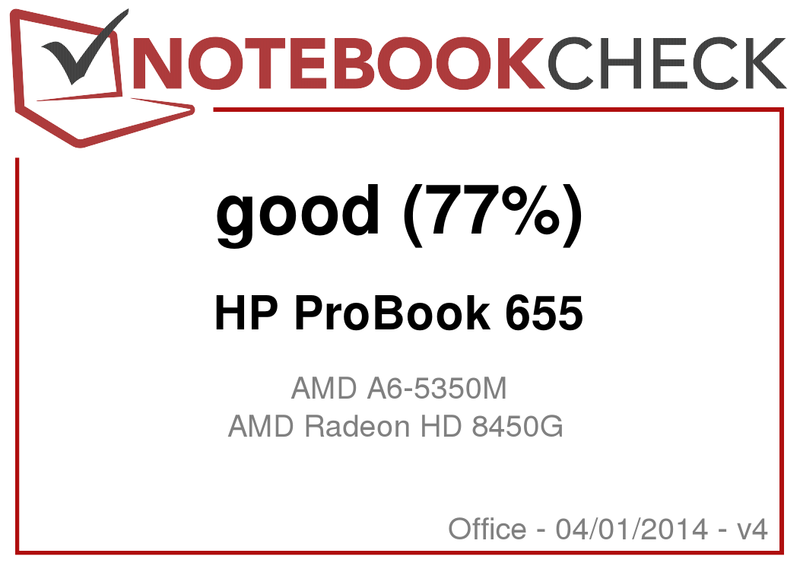 The ProBook 655 is the AMD version of the ProBook 650 (Core i3-4000M, HD Graphics 4600) we reviewed earlier this year. The Intel model made a good impression on us. Our review reveals whether the AMD version manages to do the same. In order to assess the notebook in relation to its competition, we will compare it to the Lenovo ThinkPad L540 (Core i5-4200M, HD Graphics 4600) and the Acer TravelMate P455-M (Core i5-4200U, HD Graphics 4400). Since the ProBook 650 and the ProBook 655 are structurally identical, we will not discuss the notebook’s case, connectivity, display, input devices or speakers in detail. 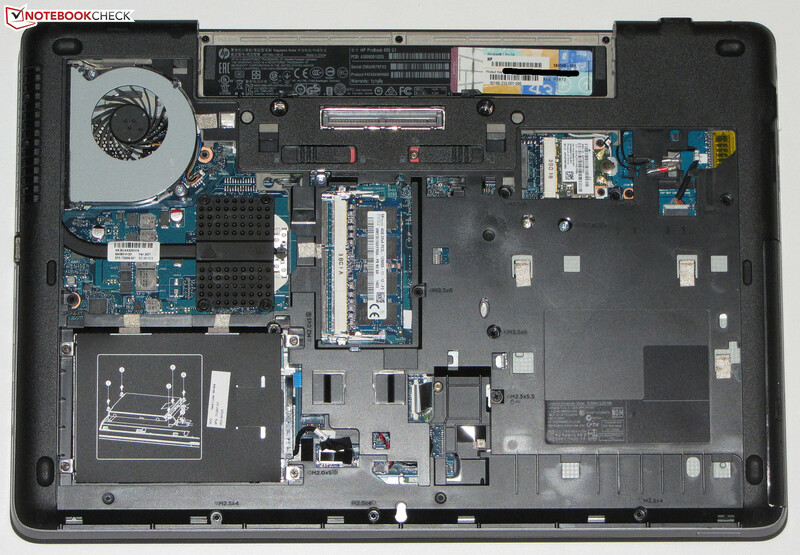 Information on those subjects is available in our review of the ProBook 650. 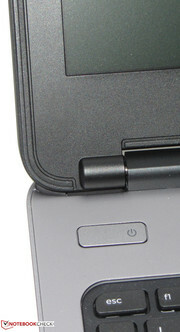 In terms of connectivity options, the ProBook 650 and 655 share the same features. There is only one small difference: While the ProBook 650 is outfitted with five USB 3.0 ports, the ProBook 655 offers only four. HP installed the same panel in both ProBooks. Nevertheless, our display measurements differed somewhat. This is normal. Two structurally identical displays are never 100% alike. As is so often the case in this price class, the ProBook 655 is equipped with a typical panel with mediocre brightness and image reproduction. The display has a visible blue cast. 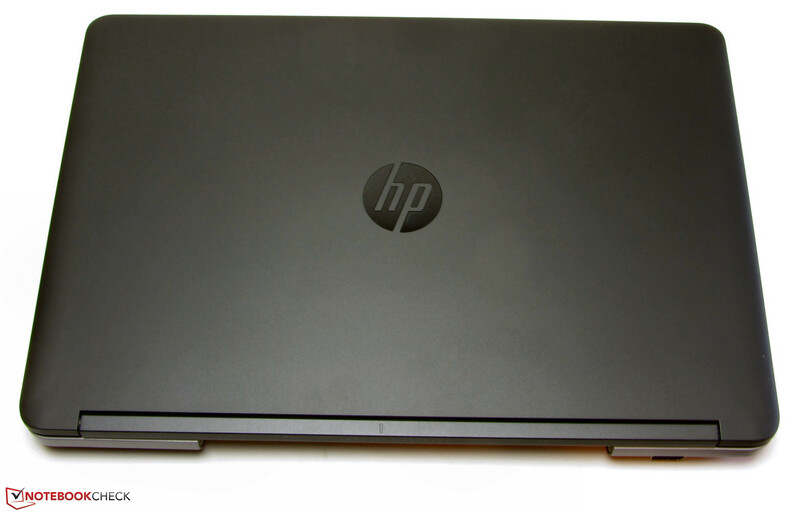 HP's ProBook 655 series is comprised of 15.6-inch business notebooks. Their performance is plenty strong enough for most office, Internet and communications-related tasks. Additionally, the computers offer security functions like a Trusted Platform Module. Our review device is available for around 750 Euros (~$1030) and is currently the most expensive device in the series. It is possible to save money by purchasing a different version. The H5G82ET model is a ProBook with an A4-4300M APU and 4 GB of working memory. It costs about 590 Euros (~$810). This version also comes with Windows 7 Professional (64-bit) and Windows 8 Professional (64-bit). Hewlett Packard equipped our ProBook with an A6-5350M APU that is still based on Richland architecture. The CPU portion is a dual-core processor that runs at a base speed of 2.9 GHz. Using turbo, the CPU's speed can increase to up to 3.5 GHz. This is a standard mobile APU with a TDP of 35 Watts. The processor completes the Cinebench benchmarks in the same way in both AC power and battery mode: While it runs the single-thread tests at 3.5 GHz (both cores), it tackles the multi-thread tests at just 3.3 GHz. Even when the CPU functions at its full capacity, it can't hold a candle to the Intel processors at work in the ProBook 650 (part of the same series), in the ThinkPad and in the TravelMate. The competing notebooks achieve substantially superior results. The system runs sturdily and fluidly. Here the ProBook profits from its quick hard drive. The results from the PCMark benchmarks are reasonably good and look normal for a notebook with an AMD APU. The ProBook cannot keep up with the TravelMate or the ThinkPad in these benchmarks either, since both computers are outfitted with much stronger processors. HP installs a hard drive from Hitachi's Travelstar Z7K500 line in their ProBook. It offers a capacity of 500 GB and runs at a speed of 7200 rpm. CrystalDiskMark records a read speed of 118.6 MB/s. HD Tune registers an average transfer rate of 98.1 MB/s. These are good numbers for a 7200 rpm hard drive. The Radeon HD 8450G graphics core is responsible for graphics output. It supports DirectX 11 and runs at a base speed of 533 MHz. Using turbo, the core's speed can increase to 720 MHz. In terms of performance, the graphics core is on par with the TravelMate's HD Graphics 4400 GPU -- the results from the 3DMark 2011 benchmarks reveal this fact. 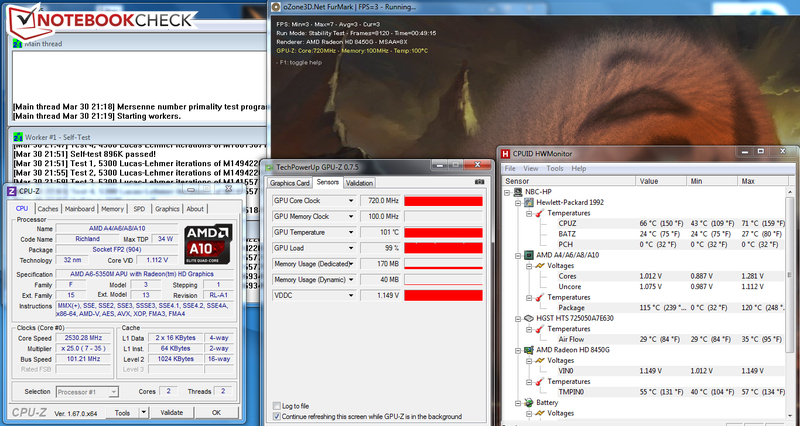 The ProBook lags behind somewhat in the rest of the 3DMark benchmarks, as it is equipped with a weaker CPU. The ThinkPad is the clear winner in these benchmarks; it is outfitted with the strongest GPU. The ProBook belongs to the business-notebook class, not the gaming-notebook class. But that does not mean the computer has to throw in the towel. It is possible to play some games at low resolution and low quality settings. Games with lesser hardware demands also run fluidly at higher resolutions and quality settings -- the various installments of the FIFA series, for example. You can eke a few more frames out of the notebook if you install a second working memory module. The working memory then runs in dual-channel mode and the graphics core is able to function closer to its full capacity. As a result, the frame rates -- depending on the game -- increase by up to 20%. We tried it: The game Tomb Raider especially profits from dual-channel mode. Its frame rates go up by an average of 40% to 54.2 fps (low), 26.3 fps (medium), and 16.7 fps (high). You certainly cannot accuse the ProBook of being overly loud. In idle mode, the computer hardly makes a peep and the fan often stands still. Under medium load (3DMark06 running) and full load (stress test, Prime95 and Furmark running), the ProBook's sound pressure levels reach 34.1 and 38.3 dB respectively. These levels are certainly tolerable. The ThinkPad behaves similarly to the ProBook. The TravelMate goes about its work more quietly. That is not surprising, as it is the only one of the three competing devices with a ULV processor. The ProBook 655 in the stress test. Neither in idle mode nor under full load do any of the three competing devices grow excessively hot. The temperatures are in the green in every spot we measured. 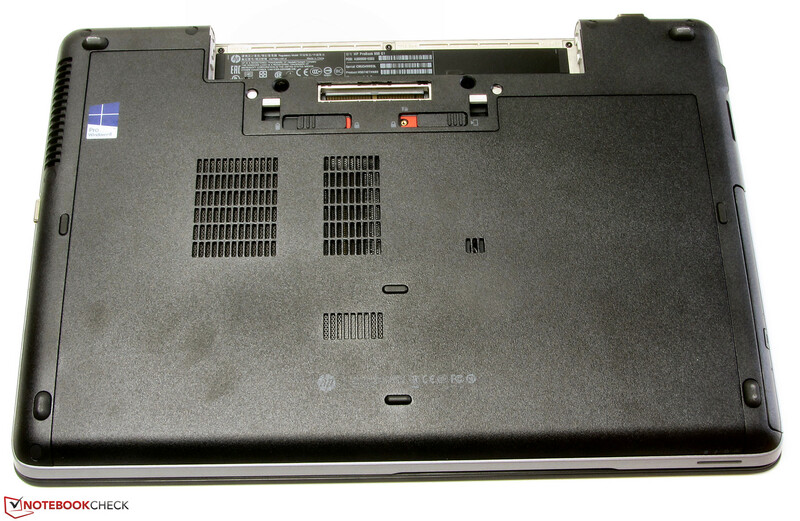 The ProBook only crosses the 40 °C (104 °F) in one spot under full load, near the fan -- the same goes for the ThinkPad. Overall, the TravelMate warms up less than its competitors, thanks to its ULV processor. The ProBook completes the stress test (Prime95 and Furmark running simultaneously for at least an hour) the same way in both AC power and battery mode: The CPU runs at 2.5 to 2.9 MHz and the graphics core works at full speed (720 MHz). (+) The average temperature for the upper side under maximal load is 27.7 °C / 82 F, compared to the average of 29.4 °C / 85 F for the devices in the class Office. (-) The average temperature of the palmrest area of similar devices was 28.2 °C / 82.8 F (-2.1 °C / -3.7 F). In idle mode, the ProBook's energy-consumption rate lies between 9.4 and 14.5 Watts. These numbers are still acceptable, but nowadays they should be lower. The ProBook 650 shows how it is done (4.6 to 9.4 Watts). Under medium load (3DMark06 running) and full load (stress test, Prime95 and Furmark running), the ProBook 655's energy consumption increases to 41.2 and 50.8 Watts respectively. Here too, the ProBook 650 (37.1 and 41.5 Watts respectively) exemplifies how it should be done. Do not forget: The ProBook 650's performance is considerably higher than that of the ProBook 655. The ThinkPad is on par with the ProBook 655 in every mode. Thanks to its ULV CPU, the TravelMate proves to be more frugal. In idle mode, the ProBook's battery holds out for 9:19 h. The TravelMate (8:13 h) and especially the ThinkPad (6:31) peter out earlier. 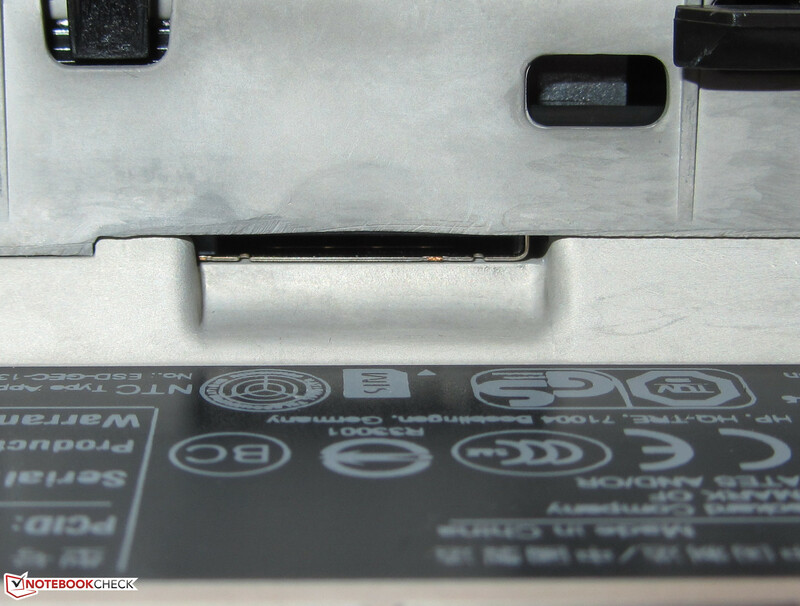 We determine a notebook's battery life in idle mode using the Battery Eater Reader's test. The display runs at the lowest brightness setting, the energy-saving profile is active and the wireless modules are turned off. Under load, the ProBook runs out of steam after 1:24 h. With that time, the notebook positions itself between the TravelMate (1:05 h) and the ThinkPad (1:33 h). The device's battery runtime under load is established by the Battery Eater Classic test. In this test, the display is set to full brightness and the high-performance profile and wireless modules are activated. The ProBook ends the WLAN test after 4:48 h. The TravelMate (4:30 h) and the ThinkPad (4:58 h) reach similar runtimes. In this test, the computer uses a script to automatically load a new web page at 40-second intervals. The energy-saving profile is active, and the display brightness is set to around 150 cd/m². DVD playback ends after 3:13 h on the ProBook. Once again, our review device positions itself between the TravelMate (3:34 h) and the ThinkPad (3:00 h). We run the DVD test with the energy-saving profile activated (or a higher profile if the DVD does not play fluidly), the display at full brightness and the wireless modules deactivated. All in all, the ProBook's battery life is completely respectable and more or less what we would expect from a 15.6-inch computer. The TravelMate can keep up with its two competitors, even though it has a considerably smaller battery (HP: 55 Wh, Lenovo: 56 Wh, Acer: 37 Wh). It profits from its ULV CPU here. 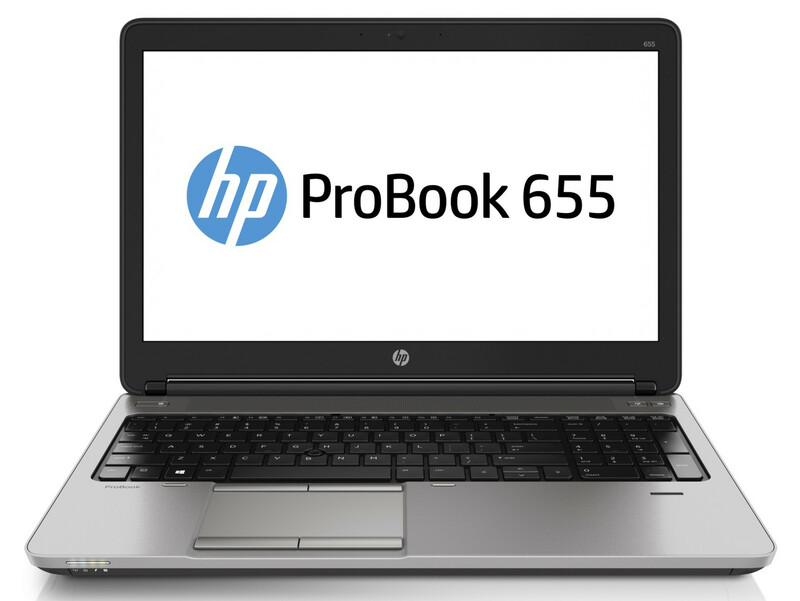 HP's ProBook 655 is a classic business notebook in the 15.6-inch format. It offers a docking connector, easy maintenance and upgradeability, and a TPM chip. It is also pre-equipped for the installation of an LTE/3G module. A good range of connectivity options, good input devices and a very respectable battery life complete it all. The APU's performance is sufficient for daily business-related tasks. The display, however, deserves some criticism. It is dark, has weak contrast and a blue cast. For more than 700 Euros (~$960), the panel should be higher quality. Beyond the notebook's objective rating, it is hard to think of a reason to buy the device. Its sister model, the ProBook 650, is responsible for that. The version of the ProBook 650 (Core i3-4000M, HD Graphics 4600) we reviewed is currently available for about 699 Euros (~$960) -- less than the cost of the ProBook 655 model we reviewed in this article. At the same time, the ProBook 650 offers considerably more performance, a somewhat longer battery life, and a lower energy-consumption rate in our test that simulates practical, everyday use. The Acer TravelMate P455-M is worth your consideration if you are looking for a matte Full HD display. The Acer computer also uses very little energy. The Lenovo ThinkPad L540 is outfitted with a matte Full HD display as well. Of our three competing devices, it also offers the most performance. The DVD burner reads and writes to every kind of DVD and CD. ...hold the lid tightly in position. The back side of the lid is rubberized. No tools are needed to open the maintenance hatch. 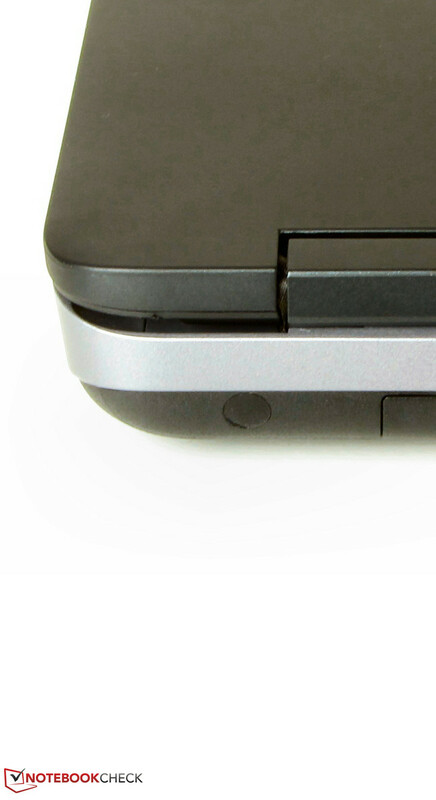 The SIM card slot is located in the battery compartment. The battery weighs about 317 grams (~0.7 lbs) and has a capacity of 55 Wh. The power supply's weight is about 235 grams (~0.5 lbs) and has a power rating of 65 Watts. That the computer runs quietly and maintenance is easy. A better display and longer warranty coverage. The display HP installs in their notebook is not up to snuff for this price range. We would expect a display like this in a lower price class at best. Lenovo ThinkPad L540, Acer TravelMate P455-M, Dell Latitude 3540, Lenovo ThinkPad Edge E540, Lenovo ThinkPad Edge E545, Fujitsu Lifebook A544, HP ProBook 650, HP ProBook 450, HP ProBook 455, Acer TravelMate P255-M, Lenovo B5400.